2012 saw a rise in net company growth in Nottingham, according to the latest Duport Business Confidence Report for the area. A new report from company formation specialists, Duport.co.uk shows there was a rise in net company growth in Nottingham during 2012. A total of 1420 companies were added to the company register for Nottingham in 2012. This number represents growth of 40.3%, just slightly behind UK average figure of 43.8%. In addition, company formation in Nottingham rose sharply during 2012, with 3762 new company formations - more than any other year on record for the city. 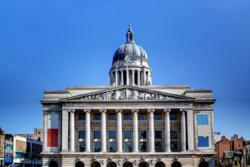 More than £3.5 billion is currently being invested in Nottingham, a combination of public and private sector funds, covering transport, infrastructure and the built environment. The ongoing regeneration of the area could be a factor in the high level of net company growth and company formation. The Duport Business Confidence Report for Nottingham provides accurate data and statistics on the local economy of the area. More information can be found at http://www.duport.co.uk/nottingham.